The top quarterback recruits in the class of 2017 have already settled on their college destinations. Here's how they fit in their new programs and when they could see playing time. Alabama’s run to the national championship game with Jalen Hurts at quarterback this season is the most prominent recent example of a program thriving with a first-year signal caller under center. When Hurts arrived in Tuscaloosa out of Channelview (Texas) High as a mid-year enrollee last year, he entered a heated position battle featuring both more experienced (Cooper Bateman) and more highly touted (Blake Barnett) options. But by the end of the first quarter of the Crimson Tide’s season-opening 52–6 blowout of USC, Hurts had seized control of the starting job. A few months later, after being named the SEC’s offensive player of the year, he came one two-yard Hunter Renfrow touchdown reception away from becoming the first true freshman QB to lead a team to a national title since Oklahoma’s Jamelle Holieway in 1985. You’ll notice the large gap in national ranking between Mills and the second quarterback listed here. That attests to his status as the clear top prospect in the class, a distinction that owes to his combination of size, accuracy and a clean release. “Mills is a very efficient passer,” Scout.com notes. “His passes are very catchable, he throws with good timing, and he just knows where to put the football.” Scout.com staffers named Mills the top quarterback at the prestigious Elite 11 Finals last summer, and he led Greater Atlanta Christian to the state championship game this season after missing the first two games with a knee injury (the recovery timeline from which was initially expected to be 3–4 months). Mills will probably have to wait at least one season before being considered for the starting job at Stanford. Junior Keller Chryst is back after replacing senior Ryan Burns as the starter late in 2016, though a torn ACL in the Cardinal’s win over North Carolina in the Sun Bowl should allow K.J. Costello, a blue-chip quarterback Stanford signed as part of its 2016 class, to make a run at the top spot on the depth chart this off-season. (Chryst reportedly will sit out six months at minimum.) Either way, it seems unlikely Mills will be leading the Cardinal’s offense on the field in its Sept. 2 opener against Rice in Australia. But that could be an underestimation of his talent; Mills is good enough to earn an early run piloting Stanford’s pro-style attack. Martell may not be the most highly rated quarterback in this class, but no other signal-caller in the group has attracted as much attention from fans and media over the course of his recruitment. He issued a verbal commitment to Washington as a 14-year old, when current Alabama offensive coordinator Steve Sarkisian was the Huskies’ head coach. Martell backed off that pledge after Sarkisian left Seattle to become USC’s head coach in December 2013 and later committed to Texas A&M. Then Martell opened up his recruitment again last May, in a move that sparked a controversy involving another Aggies commit and an assistant coach sending out cryptic tweets. About a month later, Martell had made up his mind for good and announced he would attend Ohio State. Don’t expect Martell to play right away at Ohio State. The Buckeyes will bring back veteran J.T. Barrett as the starter next season, and they signed four-star quarterbacks the previous two years in Dwayne Haskins Jr. and Joe Burrow. That said, Martell can benefit from a year watching an experienced winner operate under new offensive coordinator Kevin Wilson and quarterbacks coach Ryan Day. Fromm’s flip from Alabama to Georgia last March was one of the first indications that new Bulldogs coach Kirby Smart wasn’t going to back down from his former boss in Tuscaloosa, Nick Saban, on the recruiting trail. It also represented another massive recruiting win at the most important position on the field for Georgia, a few months after Smart convinced former five-star prospect and starter Jacob Eason to stick with the Bulldogs in the wake of the program’s decision to fire former head coach Mark Richt. When Tagovailoa committed to Alabama last May, it seemed an odd choice for a prospect who resided more than 4,000 miles from Tuscaloosa and who played at the same high school that recently produced a star at a different program closer to home. Like former Oregon stud and 2014 Heisman Trophy winner Marcus Mariota, Tagovailoa spent his prep career at Saint Louis School in Honolulu. But unlike Mariota, Tagovailoa did not choose the Ducks. Willie Taggart pursued Tagovailoa after he was hired as Oregon’s new coach from South Florida in December, but by that point it was too late. The lefty was headed to join the Crimson Tide death machine as the offensive headliner of the nation’s top recruiting class. After Hurts’s stellar true freshman campaign, it could be a while before Tagovailoa, as well as fellow four-star 2017 quarterback commit Mac Jones, have a real shot at the starting job. But it would be silly to downplay Tagovailoa’s chances of getting on the field early in his college career. It’s not hard to envision him leading Alabama to an SEC title and College Football Playoff berth in a couple of years, if not sooner. As reluctant as Clemson fans may be to consider a future without the quarterback who just won the program its first title in more than three decades, the succession of passers the Tigers have lined up behind Watson should soften their disappointment over his departure to the NFL. It is impossible to replace a signal caller of Watson’s caliber without some slippage, but Clemson certainly won't face a lack of quarterback talent going forward. 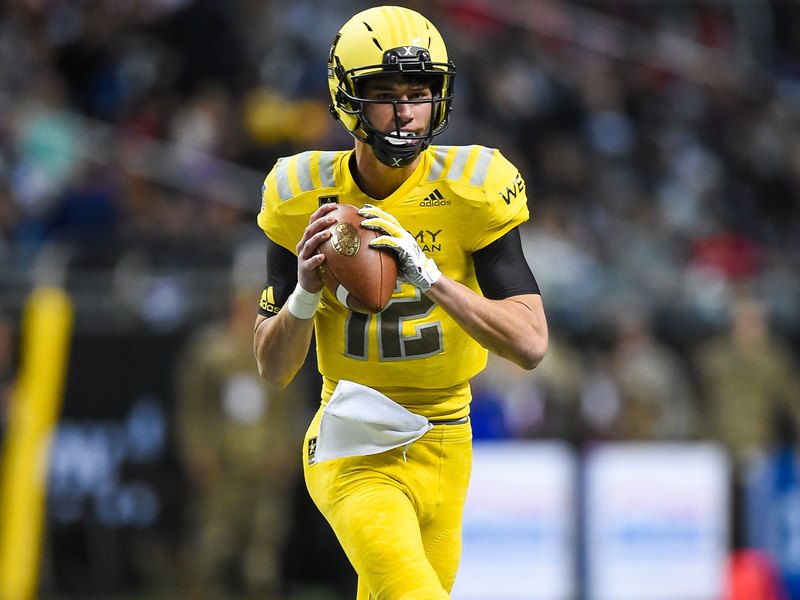 Johnson will join a deep QB rotation that includes sophomore Kelly Bryant, freshmen Zerrick Cooper and Tucker Israel and fellow 2017 quarterback recruit Chase Brice (to say nothing of 2018 five-star commit Trevor Lawrence). While Johnson may not be in the running for QB1 status in 2017, he looks capable of developing into a high-level starter for the Tigers. As a senior at Brownsburg this season, Johnson passed for 2,233 yards and 25 touchdowns and added 525 yards and three touchdowns on the ground. 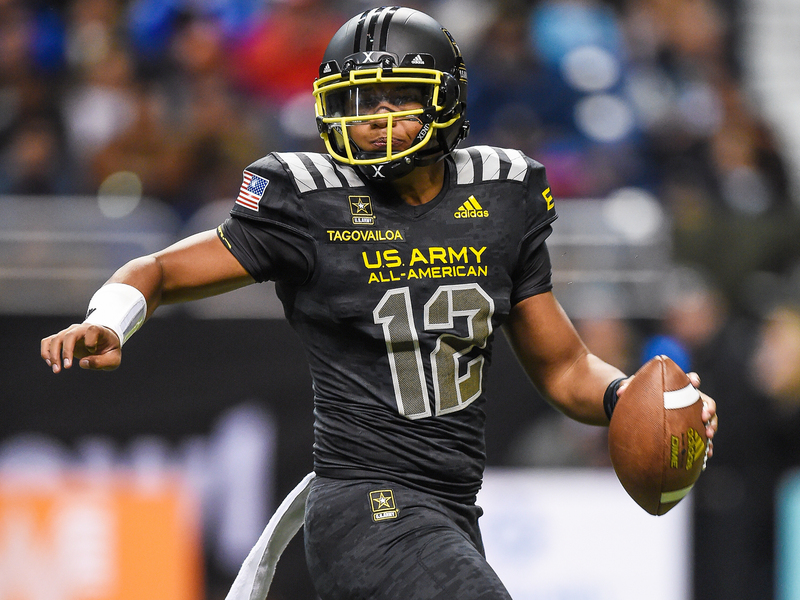 He was also named the MVP of the U.S. Army All-American Bowl. A former Tennessee commit who flipped his commitment to the Tigers in December 2015, Johnson has impressed talent evaluators with his quick release and ability to evade pressure in the pocket. “Gets rid of the ball quickly, makes quick decisions and hits receivers in stride,” Scout.com notes of Johnson. “Can gun it into tight windows but can also drop passes in over the top of defenses and knows when to use touch and when to use velocity.” That sounds like the type of QB who can get Clemson back to where it ended this season. Robinson may have a better chance to start right away than any of the quarterbacks ranked higher than him by Scout.com. The Horned Frogs’ offense’ regressed last season under Texas A&M transfer Kenny Hill as TCU dipped from a preseason top 15 team to a 6–7 finish and 4–5 record in the Big 12. Hill, who led the conference with 13 interceptions and ranked 68th nationally in passer rating in 2016, does have another year of eligibility remaining, and two other young quarterbacks should be in the mix (freshman Brennen Wooten and sophomore Grayson Muehlstein). Yet Hill’s backup last season, Foster Sawyer, announced earlier this month that he would transfer, and Robinson offers more upside than both Hill and the two aforementioned passers with whom he’ll compete for playing time. As an early enrollee, Robinson will have the advantage of participating in spring workouts. And if his senior high school season is any indication, Robinson should thrive as the triggerman of the spread system that catapulted Trevone Boykin into the thick of the Heisman Trophy race in 2014 (despite ex-co-offensive coordinator Doug Meachem’s recent move to Kansas). When Ehlinger announced his intention to attend Texas in July 2015 with one of the better Twitter-transmitted commitments in recent memory, he made clear that he’s wanted to be a Longhorn for a really long time (see below). Unsurprisingly, Ehlinger stood firm on his pledge after Texas moved on from former head coach Charlie Strong and offensive coordinator Sterlin Gilbert and replaced them with former Houston head coach Tom Herman and Ohio State assistant Tim Beck. Though Shane Buechele will enter 2017 atop Texas’s QB depth chart after taking hold of the starting job as a true freshman in 2016, a staff and system overhaul could open the door for Ehlinger to push Buechele in spring practice. The brother of departing Stanford star Christian McCaffrey will not play for the Cardinal, though a recent hire by the Wolverines ensured he would get to work closely with a former Stanford coach. (Michigan added former Cleveland Browns assistant and former Stanford offensive coordinator Pep Hamilton to replace passing game coordinator Jedd Fisch, who left to become UCLA’s offensive coordinator.) Dylan McCaffrey seems an excellent fit for the Wolverines’ pro-style offense, as his pocket presence is one of the main reasons he’s earned high marks from recruiting services. “He’s a pure pocket passer with good athleticism and a great feel for the game,” Scout.com notes. “He’s a natural leader with the arm strength needed to make all the throws and is able to escape pressure and make a play with his legs.” As a senior at Valor Christian this season, McCaffrey completed 67% of his passes for 2,796 yards with 31 touchdowns against just five interceptions while recording 579 yards and 10 touchdowns on the ground to lead the Eagles to a state championship and earn Colorado’s Gatorade Player of the Year honor. He’s one of the most esteemed prospects in a Wolverines recruiting class that also features two of the nation’s top wide receivers, Cass Technical (Mich.) High’s Donovan Peoples-Jones and Cheshire (Conn.) Academy’s Tarik Black, as well as five four-star offensive linemen. With upperclassmen Wilton Speight and John O’Korn, sophomore Alex Malzone and freshman Brandon Peters returning to Ann Arbor next season, Michigan fans may not see McCaffrey much, if at all, in 2017. Yet he could be vying for the starting job in the near future. Arguably no program has gotten better quarterback play the last two seasons than the Sooners from Baker Mayfield, but they’ll need to find someone to fill in for the former walk-on after he moves on next off-season. Robison will be part of that replacement plan, along with Texas A&M transfer and former super-recruit Kyler Murray and class of 2016 four-star prospect Austin Kendall. Robison has the potential to eventually jump both of those signal-callers on the depth chart, but in the meantime he’ll have to settle for watching Mayfield likely deliver another Heisman-caliber season while learning offensive coordinator Lincoln Riley’s Air Raid system. Robison is the top-ranked commitment on the offensive side of the ball for Oklahoma in its 2017 recruiting class. He’s joined by two talented wide receivers in Cedar Hill (Texas) High’s Charleston Rambo and Foster (Texas) High’s CeeDee Lamb, plus a heralded pass-catcher at tight end in Santa Margarita Catholic (Calif.) High’s Grant Calcaterra.